The World is full of technology anywhere and everywhere! And there are geeks in every part of the world, who invest all their time to create mind-boggling geeky gadgets which are worth having a look and If given a chance, people will be dying to use these gadgets too. If you are a person curious about a room temperature and humidity, you should get yourselves a Kestrel Drop D3! Kestrel Drop D3 is a device that records, monitors and logs all the weather and temperature changes in its parameters and sends the reports to the Bluetooth enabled device either your mobile and any other Bluetooth enabled devices. Kestrel Drop D3 is rugged with water-resistance and dust proof which is military and International standard. So, no matter how the weather outside is, they continue to work with no issues. The Kestrel Drop D3 Stores thousands of data points and records every minute changes in the temperature. Refresh rate can vary and customizes from 2 seconds to 12 hours. It can record humidity, station pressure, density, and pressure trend. As discussed earlier, the Drop D3 can wirelessly transfer the records to the mobile app or any Bluetooth-enabled devices at a minimum distance of 100 meters. Comes in two other variants D2 being the mini version of D3 and D1 being only Temperature Logger. Current Cost: starts from $120 with Free Shipping with 5 years warranty from the manufacturer. This AI-based Music player is the next on the list of the best geeky gadgets. And it’s for a good reason – it only plays what you wanted it to play! Cone/Aether Cone Music player learns your preferences based on the initial usage. It learns what you love to hear, what you skip through and stores that in its “mind”. Later, when you start asking it to play songs it only plays your playlist that you prefer. If you change your mind and wanted to skip to other songs, just use the dial and spin slowly for minor mood changes. If you totally want Aether Cone to surprise you, spin it all around and get into a new World. Aether Cone thinks and listens to your request, and learns your taste based on the results. Has AirPlay and Bluetooth support and allows access to Thousands of radio stations across the World or based on your location, with access to RDIO’s database of millions of songs. The All New LG Tone Studio has released the innovative wearable wireless speakers which immerse a person with speakers placed strategically. The speakers help the user to immerse into the scene, thanks to the 3D Surround technology! And LG Tone also has bass speakers to provide a deep sense of the scene, by projecting subtle vibrations onto the person using the Studio. Not just for streaming, this Wireless Studio enables Talk time, Music, gaming, etc. With the beast-like battery power of up to 61 days, Standby time and only 2 hours of charging this personal speaker is indeed a beast. Sound Designed by DTS with pure amplitude. Retractable Earbuds for portability and privacy when you are outside. 32-bit DAC provides rich Hi-Fi Sounds. Dual play to connect two studios at a time and enjoy a single stream with your loved ones for unique personal speaker experience. This is one of the dreams come true geeky gadget. PowerUP FPV is a paper turning into your drone! It has a live streaming camera which can be accessed through VR or your Smart phone, they provide with Google Cardboard. On-Flight experience with VR Controller with a slight tilting of your head. The rigid body which is indestructible, Rotating camera. Create your own airplane designs with the paper, attach the FPV module to the paper plane and boom your Drone is up and running! Current Cost: Available on Kickstarter. Reviews: Kickstarter Backers, who got the PowerUP FPV, started playing with their paper drones, one of the funnier incident being, the customer’s drone got stuck in the tree for 5 days after severe rainstorms, it fell. He was surprised to see with few amendments, the FPV was up and running and all his previous footage along with module were safe! 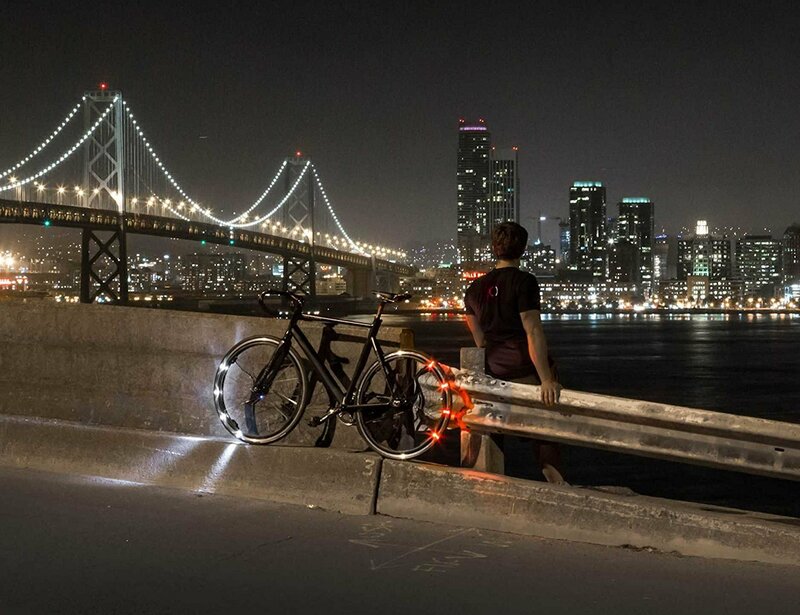 Revolights Bicycle lighting system is a very geeky gadget that has won many awards for its geekiness. This lighting system has Legal Headlight, Brake/Smart Tail light. Each tire is fixed with 24 LED lights, with 8 on at any given time for visibility of Road and for alerting traffic around you. The legal headlight projects blade like a light for seeing both the road and the street signs and the Smart Tail light acts a smart Brake system. 360o Visibility, unlike other bicycle lighting system, the Revolights can be visible from any side and any angle of the road. Easy Installation with an innovative technology called Eclipse to snap in the battery for the LEDs after recharging every time.